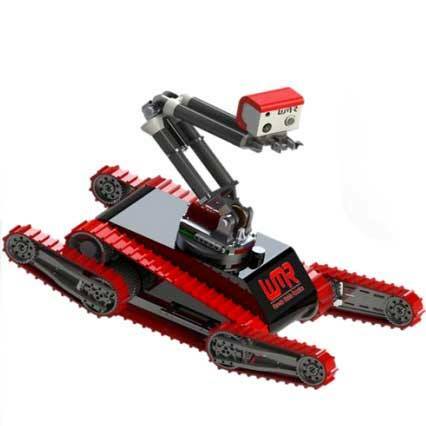 Autonomous and Tele-operated tracked robot platforms designed to navigate a simulated collapsed building. Functionality includes thermal vision, two way communication, CO2 sensing and illumination. 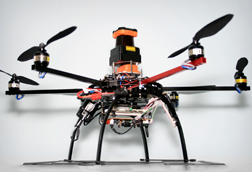 An ongoing PhD project to develop an UAV to internally inspect buildings. This project is sponsored by Sellafield Ltd to help with their task of safely decommissioning the old Sellafield site. A research project by a 3rd year electronics student investigating the viability of using a Raspberry Pi for autonomous flight. Current progress including reading flight path from Google Earth, tracking and direction correction. 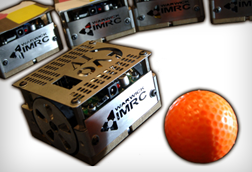 Autonomous five aside 7.5cm robot football team. A PhD project to develop an autonomous vehicle for grass cutting tasks. A ride-on greens mower that has been modified to be controlled by a computer and fitted with low-cost GPS.